It has not even been a month since West Bengal elected TMC, West Bengali Hindus are already being subjected to riots in West Medinipur. Large scale violence erupted in West Medinipur district in West Bengal after an altercation broke out between Hindus and Muslims yesterday. Many shops and houses of Hindus have been torched in the aftermath of this incident. Bikes and cars have been torched and there has been huge damage caused to public and private property. According to local sources, heavy police force has been deployed but situation is still very tense. 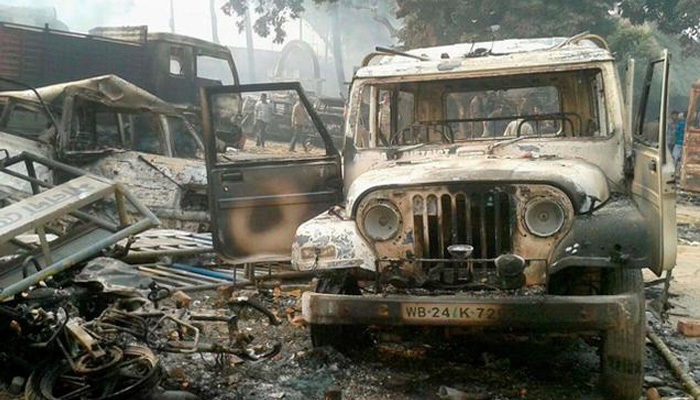 West Medinipur dist: Large scale violence On Hindus by rioting Muslims at Chandrakona Road @ Garbeta PS. RAF, heavy police force deployed. As per some reports, loud speakers from mosques are heard saying that this is the last time Hindus will have their peaceful nights and that Hindus will be killed thereafter. The mosques have also made open calls to Hindus to permanently leave the area if they wish their safety. The tribal Hindus along with some locals have supposedly started to retaliate against these attacks and reserve police have been deployed there to prevent further escalation of the riots. The constant riots engineered against Hindus in Bengal despite the Bengali secular pretensions is worrying. Details are still awaited and it is yet to be seen if the media will even cover it seeing as the local media seems to have ignored the hundreds of Hindu livelihood destroyed to protect the secular fabric and intellectual superiority of Bengali communists and secularism of TMC. West Bengal gave enormous mandate to Mamta Banerjee even after TMC mishandled the Malda riots and did not take any action against the rioting Muslims. Given high population of Muslims and rising radicalization in West Bengal, such riots will only become more common in near future. The way TMC has handled Muslim rioters with kid gloves, it will only lead to further worsening of the communal situation in West Bengal.